As required by law, the Cape Charles Town Clerk today posted notice of a Thursday, March 20, closed-door meeting of Town Council to discuss, in her words, “another real property acquisition opportunity.” The notice, shown above, fails to state what property is being considered. According to Virginia law, “A general reference to . . . the subject matter of the closed meeting shall not be sufficient to satisfy the requirements for holding a closed meeting.” But in keeping with past practice, the clerk nevertheless has failed to identify what property is being considered. After the Wave began covering Town Hall in 2012, the clerk did begin providing slightly more information about closed sessions. 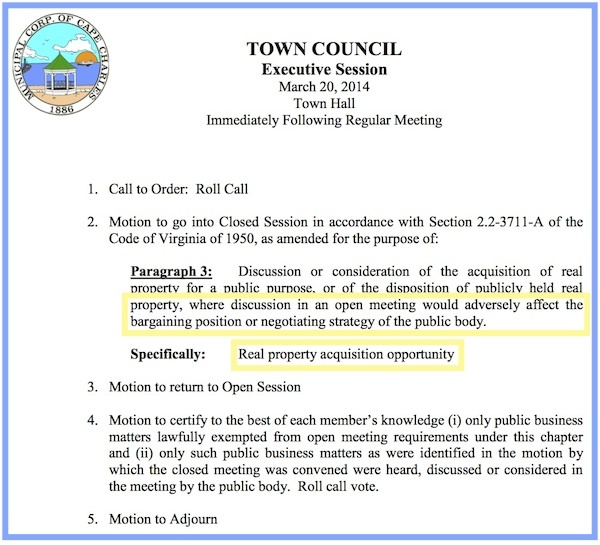 Previously, for example, when Town Council met to secretly negotiate a no-bid contract to divest Central Park property for $10, the meeting was described by the clerk only as consideration of an “Unsolicited Confidential Proposal,” with no hint that real estate was involved.